The cottage, heated, has two masters bedrooms with a bed of 140 x 190 : one can welcome a baby bed and the other has a storage headboard (mattress, blanket, pillows and mattress covers).There are two other rooms : one with two beds of 70 x 190 and the other equipped with a trundle bed = two beds (mattress, blanket, pillows and mattress covers). The kitchen and its "bar américain" is fully equipped with a utensils kit for 8 persons, refrigerator-freezer, 4 gas rings, microwave, coffee maker and dishwasher. 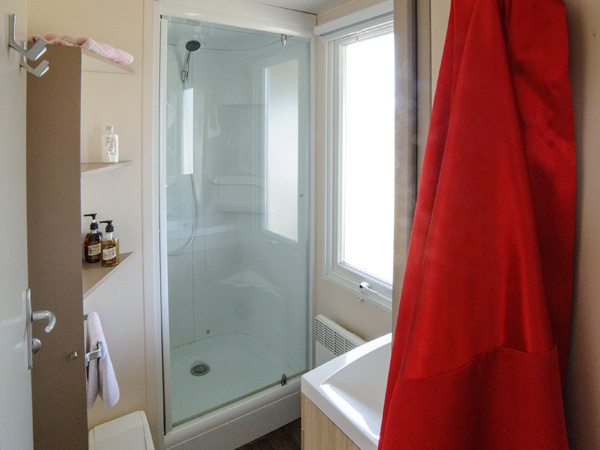 The bathroom includes a 80 x 80 cm shower. The toilets are separate. For your peace, the windows are fitted with mosquito nets.